This project will require seven boards. The first five boards will be walnut. Board number one should be 1” x 10” x 72” for the top (A). The second board should be ¾” x 10” x 96” for pieces (D), (E), (G) & (H). The third board should be ¾” x 12” x 84” for pieces (F), (I), (J), (K) & (L). The fourth board should be ¾” x 5” x 48” for the bottom front oval trim (M). The final walnut board will be 7” x 96” for the crown molding (B) & (C). The Next two boards will be fir. The first should be ¾” x 8” x 96” for pieces (N) & (O). The second fir board should be 1 ½” x 3 ½” x 72” for the ledger (P). For the first four boards use a jointer to surface one edge and a planer to surface one face. Next, turn each board over and take a trim cut. Use a table saw and a radial arm saw to cut board one to 1” x 9 ¼” x 70 ½” for the top (A). For board two use a table saw to rip it to the proper widths and a miter saw to cut both the ends of (D) & (G) and one end of (E) & (H) to 45 degree angles. For the third board cut out the ¾” thick pieces (K) & (L). Use a table saw to rip them to the proper widths and a miter saw to cut the both ends of (K) and one end of (L) to 45 degree angles. The remainder of the third board should be planed ½” thick. Then cut out the bottom (F) to its proper width and length. Use a table saw to rip pieces (I) & (J) to their proper widths, and a miter saw to cut both ends of (I) and one end of (J) to 45 degree angles. NOTE: One end of (E), (H), (J) and (L) should be cut square with a miter saw so they will fit flush with the wall. Draw the size and shape of the bottom front oval trim (M) on the fourth board. Use a band saw to cut the shape of the oval, and a spindle sander to smooth the edges of the shape. Cut the first fir board to the proper widths and lengths for the nailer (N) and the braces (O). Finally, cut the ledger (P) to the proper length. A compound miter saw should be used to cut both ends of the front crown molding (B) and one end of the side crown moldings (C) to 45 degree angles. Also use the compound miter saw to cut one end of the two side crown moldings square so they will fit flush with the wall. Assemble the mantel in the upside position. Place a couple of beads of wood glue on the nailer (N ) and position it flush with the front edge of the top (A) Use a nail gun with 1 ½” nails to secure them together. Place glue on the ends of the crown molding (B) and (C). Secure them together with nails. Use a damp rag to clean up excess glue. Glue and clamp the two braces (O) to the bottom side of the nailer (N ) and the inside of the crown molding (B). Glue and nail the front (D) to the braces (O). Also glue the top edges of the front (D) to the bottom edges of the front crown molding (B). Be sure that the front and the crown molding are flush with each other. Glue and nail the sides (E) front (D). Also glue top edges of the sides (E) to the bottom edges of the side crown molding (C). Glue and nail the bottom (F) to the bottom edges of the front (D) and the sides (E). Glue and nail the top trim pieces (G) and (H) flush with top edges of the top (A). Glue and nail the middle trim pieces (I) and (J) to the crown moldings (B) and (C) and the front (D) and sides (E). The trim should cover the seams where the crown moldings join the front and side pieces. Glue and nail the bottom trim pieces (K), (L) & (M) onto the bottom of the front (D) and the sides (E). Fill all nail holes, cracks and defects with walnut wood dough. Allow the wood dough to dry and then sand flush block of wood and sandpaper. Use an orbital sander to rough sand the mantel with 80 grit sandpaper. Intermediate sand with 120 grit sandpaper. Finish sand with 220 grit sandpaper. Hand sand all crevices, corners, edges and the concave shape of the crown molding. Use compressed air to blow off the sanding dust. Use a tack rag to remove any excess sanding dust. If stain is desired, apply with a brush, and allow 5-10 minutes to penetrate and then remove with a clean rag. Do not allow the stain to dry before removing excess. Allow the stain to dry 6 hours and then repeat the process with a second coat of stain if the first coat is not dark enough. Allow the stain to dry thoroughly over night. Apply a clear finish such as varnish, polyurethane, lacquer, etc. using a pure bristle brush. Allow finish to dry 24 hours. Lightly hand sand using 220 grit sandpaper, and remove the sanding dust with a tack rag. Repeat steps 4 and 5 for a second and third coat of finish. Use a stud finder to locate the centers of wall studs. Locate the position for the ledger (P). Secure the ledger to the wall using 3 ½” wood screws. Be sure to use a level for this procedure. Position the mantel on top of the ledger and secure with 2” finish nails. 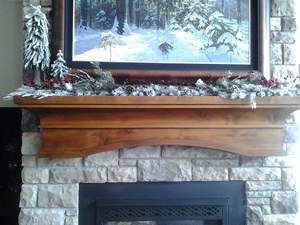 Set the finish nails below the mantel surface and fill the holes with wood dough. Allow the wood dough to dry and lightly hand sand the wood dough flush. Use a small brush to touch up the finish. Be sure to match the wood dough color with the color of the stain. Be sure to use a tack rag between each sanding and finish procedure. It is advisable to pre-drill holes a slightly smaller diameter than the wood screws. 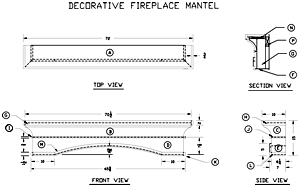 Mantel dimensions may need to be altered to fit the size of your fireplace. The ledger should be mounted so that the bottom of the mantel is a least 12” above the fire box opening. To be sure that you are complying with building code, it is recommended that you check with your local Building and Safety Department. This is usually located at the City Hall. 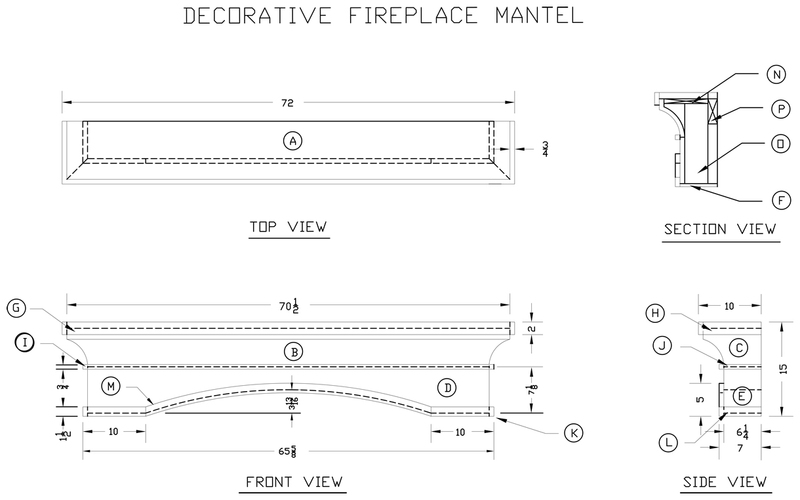 *Congratulations, your custom decorative fireplace mantel is finished and ready to use!